This past Memorial Day weekend, our group of friends got together for our third annual brew-b-q celebration. 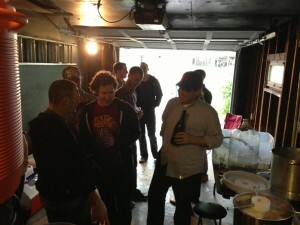 At the event, we had three groups of people, those of us brewing a “big” beer, those cooking and smoking various meats, and those enjoying the entire event. There were four of us making the beer, with many helpers on hand. Those of us making the beer each brought a couple specialty malts, hop varieties, and base malt. This year, I had some base malt I wanted to use, so I provided the base malt, 22 pounds of a mixture of pale malt, organic pilsner malt, and organic pale malt. With each of us contributing 2 pounds of specialty grains, that brought the total grains for a five gallon batch of beer to 30 pounds. By comparison, your standard batch of beer has around 10 to 12 pounds of grain. After the mash, during the boil, we added several varieties of hops, including Summit, El Dorado, Centennial, and Pacific Jade. 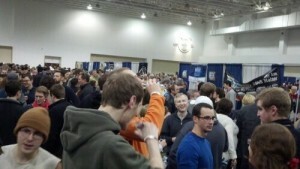 With the hop additions, the theoretical IBU’s were 128! By comparison, many very bitter IPA’s tend to be in the 80-90 range. But this was necessary for our brew, since it was going to be very strong. If everything went correctly, it was supposed to be around 14% ABV, so the large amounts of hops were to balance out the beer. Once we were done with the boil, we cooled the wort (unfermented beer), and put it into our fermentation container. Once measured, the original gravity wound up a bit lower than we expected, but it was still potentially a beer in about the 10-12% ABV range. We aerated the jug well by shaking it, then added our yeast, which was just a standard American Ale yeast. 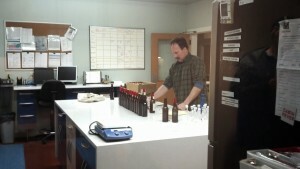 After a day, we added a Super High Gravity yeast, to keep the fermentation going when the alcohol percentage was high. 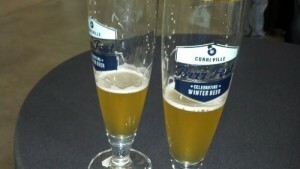 Later this year, we are going to bottle it and enjoy it when the cold nights of winter are upon us. 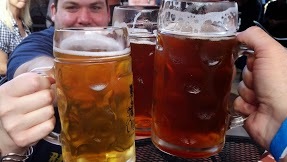 Have you made any large beers lately? How did it turn out? 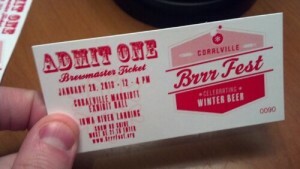 If you haven’t heard yet, Coralville’s Brrrfest 2013 happens tomorrow. 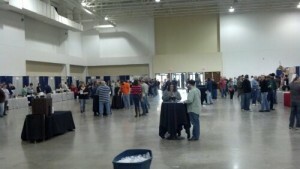 I’ll be there at noon for the Brewmaster session, so I hope the planners took my suggestions into consideration. Hope to see you there!